La Plaza is the largest shopping center in McAllen, Texas, a mid-size city on the U.S.-Mexico border. It’s the sort of establishment you’d find in any city or suburb — Foot Locker, Bath & Body Works, Baby Gap — the kind of brick-and-mortar retail dinosaur that’s been hemorrhaging money for years. But not La Plaza. This mall recently underwent a $100 million expansion. On a recent weekday — in the middle of the school year, in the middle of the week — its parking lot was full of cars. Most of them sported Mexican plates. McAllen is the biggest city in Hidalgo County, the most populous border county in Texas, not far from where the Rio Grande meets the Gulf of Mexico. Owing to its location as one of the most accessible U.S. ports of entry for migrants fleeing Central America. Hundreds of miles closer than El Paso or San Diego. The city is at the epicenter of some of the most divisive issues of the Trump administration’s ongoing anti-immigration campaign: family separations, deportation trials, military deployments, the Wall. The Border Patrol’s Ursula detention center, which became infamous last summer for housing children in chain-link cages, is in McAllen. The Border Patrol’s Rio Grande Valley sector is the busiest such sector in the country by far. Making five times as many immigrant apprehensions as any other region — 63,000 families and 23,000 unaccompanied children last year alone. It’s little wonder that when Trump flew to the border to drum up support for his $5.7 billion demand to fund the wall, he chose to stage his photo op in McAllen. “A wall works,” Trump said at a Border Patrol station, wearing a white MAGA hat. 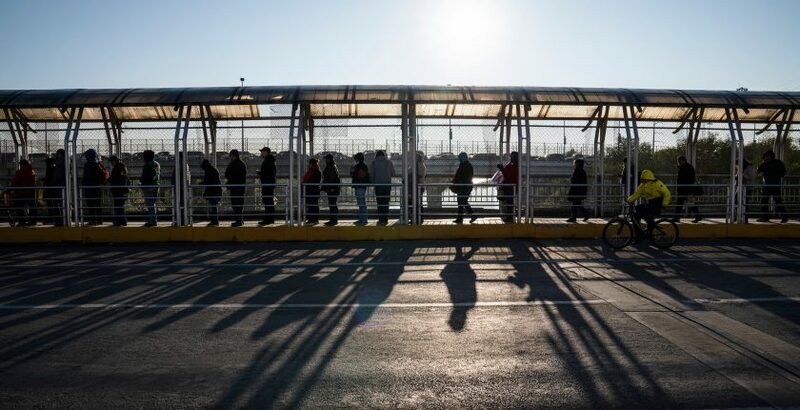 Yet somewhat lost in all the sensational immigration news is the fact that McAllen is also a prime example of how American border cities reap great economic benefits from a strong relationship with Mexico. For most of the past century, McAllen was a relatively poor agricultural center, largely dependent on cotton fields and citrus groves. But since the introduction of NAFTA in 1994 — and the resulting boom in maquiladoras, or manufacturing plants, across the river in the city of Reynosa — the region’s economy has been one of the fastest-growing in America, thanks largely to retail and international trade. Trump often says Mexico is leeching off America. But to Americans here in the Rio Grande Valley, as to millions of Americans on the border, Mexico is a boon, not a drag. The mall is just one example. Because of high import costs and comparably high sales tax, millions of Mexican shoppers cross the border (legally) to the U.S. every month. To buy everything from groceries to computers. All told, Mexican consumers pump an estimated $3 billion into the Valley’s economy each year. Coming to McAllen to shop is so common, in fact, that there’s even a Spanish word for it: macalenear. Meaning “to do McAllen”. Mayor Jim Darling says the city is one of the top sales-tax collectors in the state of Texas per capita. Whopping 40 percent of that money comes from Mexican citizens.